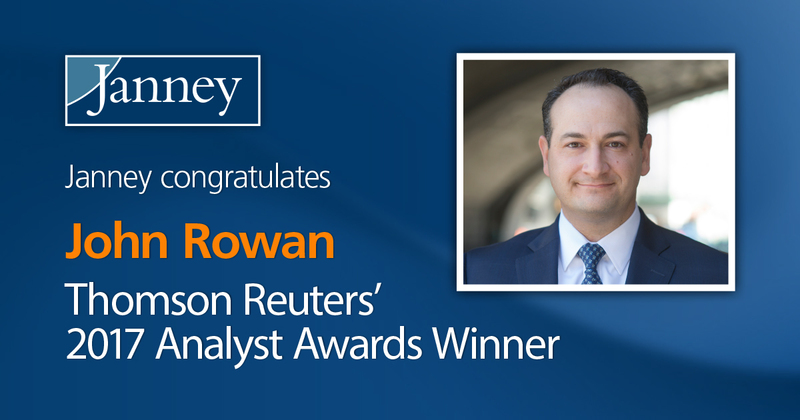 PHILADELPHIA, PA – June 28, 2017– Janney Montgomery Scott LLC (“Janney”), a leading full-service wealth management, financial services, and investment banking firm headquartered in Philadelphia, PA, announced today John Rowan, Director, Specialty Finance in the Firm’s Equity Research division, was named to the Thomson Reuters Analyst Awards for 2017. John ranked third for Top Earnings Estimators in the Consumer Finance category. This is the second year in a row Mr. Rowan has been named to this list. The Thomson Reuters Analyst Awards recognize the world's top individual sell-side analysts and sell-side firms. They measure the performance of sell-side analysts based on the returns of their buy/sell recommendation relative to industry benchmarks, and the accuracy of their earnings estimates in 14 regions across the globe. “We are proud of John’s accomplishments and believe his experience and expertise both significantly strengthen Janney’s differentiated approach to analyzing the financial sector,” said Dan Wantrobski, Head of Equity Research. Mr. Rowan has covered various financial institutions for more than a decade, but has specialized in non-bank, specialty consumer finance companies. Mr. Rowan joined Janney Montgomery Scott, LLC in May 2015, but started his career with Thompson Financial and then Wireless Capital Partners. In 2004, Mr. Rowan joined Sidoti & Co., LLC where he initially had a Midwest regional bank focus. Over the next 10+ years he diversified his coverage and focused on specialty finance companies that provided either credit or transactional based financial services to consumers that were underserved by the banking system. Mr. Rowan holds a bachelor’s degree in Finance from St. John’s University. He was ranked by the Wall Street Journal’s annual Best on The Street survey for his coverage of the specialty consumer finance sector in 2009 (5th) and 2011 (2nd).